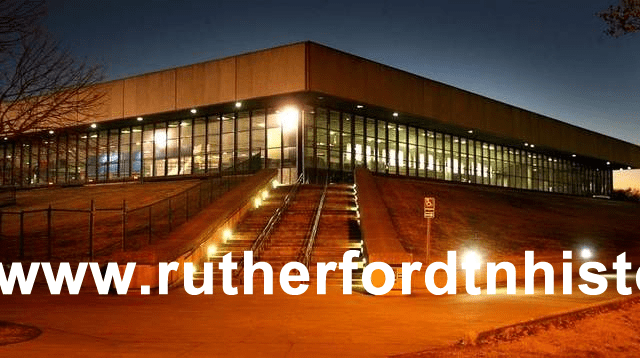 Home Rutherford History in the News Murphy Center turns 40! DNJ, Sunday, December 9, 2012 — From a win over Vanderbilt University by an MTSU Blue Raider men’s basketball team to historic appearances by rock ‘n’ roll and country music legends and even a naturalization ceremony of immigrants, Murphy Center has seen many great moments. 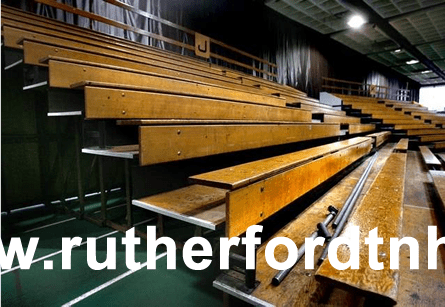 The unusual-by-today’s-standards facility — with a virtually flat roof, old-fashioned pullout wooden bleachers and upper level track surrounding a sunken floor basketball court — Murphy Center has stood the test of time. Forty years, to be exact, as of Dec. 11. But in a sports entertainment era where state-of-the-art facilities are as key to putting people in the seats as they are in attracting top talent to its floors, has Murphy Center reached its pinnacle? Or is there life yet left in this venerable facility affectionately called The Glass House? What is now Murphy Center was originally named the Middle Tennessee State University Athletic, Health, Physical Education and Convocation Center — more than a mouthful when it came to writing the name of the facility on brochures and invitations, to be sure. It was constructed in 1971-72 at a cost of $6.5 million. Charlie Pigg, now 79, who was a 1955 graduate and worked part time in contract administration for a local architectural firm, returned to his alma mater as director of campus planning on July 1, 1965, just as Middle Tennessee State Teacher’s College became MTSU. “The seed for (Murphy Center) was planted in the early 1960s by former MTSU President Quill Cope,” said Pigg, who still lives in Murfreesboro. Cope formed a planning committee that included a number of people, including Pigg and Jimmy Earle, who was the men’s basketball coach at the time. Pigg said the original concept called for a basketball arena for 7,500 people to be built north of the football field. A separate field sports building would be built north of the existing Alumni Memorial Gym. But those ideas from the committee in 1966-67 changed after Cope retired and Mel Scarlett became the new president. “(Scarlett) said we needed a big facility where we can play basketball, and have our convocations (and graduations) indoors, rather than outdoors, where it is not contingent on the weather,” Pigg said. Committee members visited other gyms to look at synthetic courts that were in use at the time, but decided to stick with wooden floors. The committee also looked at various university arenas, including one on Notre Dame’s campus, where they got the idea for MTSU’s arena. The space frame roof concept of using four concrete columns to support the roof came from the Air Force Academy in Colorado Springs. The four columns are 6-by-6 feet thick by 65-feet tall with a roof load limit of 2.4 million pounds, or 1,200 tons, according to a program handed out to visitors during an open house on Dec. 10, 1972. “It’s got a cantilever concept, which causes the middle (of the roof) to chamber ” Pigg said. The result is that there is a 6-inch rise in the trusses from the edge of the roof to the middle, which allows water to run off the roof. The HVAC units are actually under the roof, inside the building. But it was Murphy Center’s $1 million glass “walls” surrounding the upper level of the building that gave it its most distinguishing characteristic and its nickname of The Glass House. Vincent Windrow, who is now director of Intercultural and Diversity Affairs at MTSU, was 6 years old in 1972 when the Murphy Center opened. “Murphy Center was a big thing for Murfreesboro and the surrounding area,” he said. As an eighth- or ninth-grader in 1978-79 at Central Middle School, Windrow and his friends used to go into the auxiliary gym on the bottom floor of Murphy Center and shoot basketball, until they were were chased out by MTSU police. When MTSU head men’s basketball coach Kermit Davis was hired in 2002, he said the arena had the same old floor, which was hard as a rock. It had orange and green seats and a scoreboard hanging down in the middle where nearly every light bulb would go out, the coach said. “We’ve seen a lot of new things, and in a couple of years we hope to see tons of more new things up top (on the track level),” Davis said. The building was dedicated as the Charles M. Murphy Center on opening night Dec. 11, 1972, named after the recently retired football coach, and at the time, athletic director. Vanderbilt defeated the MTSU men’s basketball team 69-57 on opening night. Its use today is much the same as it was when it was dedicated as a multipurpose academic, athletic, recreational and convocation center. It continues to be a place for instruction for health, physical education and recreation, for athletic functions, university convocations and public programs. But in the ‘70s and ‘80s, in particular, the building also enjoyed a run as one of the most popular entertainment venues in the Southeast. In addition to the likes of Elvis and Hope, Murphy Center played host to country music icons like Kenny Rogers and Dolly Parton, as well as rock acts like Elton John, Billy Joel and Bruce Springsteen. Later, Mr. and Mrs. Windrow saw Brandy and comedian Bill Cosby in concert at Murphy Center. Back in the day, it even served as the host venue for a circus. Kershaw said the concert industry has changed, however, and the shows have grown a bit harder to come by since the mid-1990s when the larger Bridgestone Arena in Nashville opened. But from time to time, Murphy Center’s glass windows are still rattled by country and rock artists. Kanye West, Widespread Panic, Lady Antebellum and Murfreesboro’s own Chris Young have all had billing on the Murphy marquee in more recent years. Though many renovations and improvements have been made through the years, Murphy Center has withstood the test of time, and, according to many, has many years left. Most recently, MTSU made a concerted effort to spruce up the 11,520-seat historic arena, spending $750,000 on repairs and updates for the sound system, bathrooms and the practice gym and the main floor courts. Also included were four brand-new $198,000 LED scoreboards, located above each lower level entrance. This past summer, the arena floor was sanded, repainted and resealed at a cost of $28,000. Currently, 17 of the 18 original wooden bleachers remain on the track level of Murphy Center. Roughly five of the 17 wooden bleachers cannot be mechanically moved and must be manually moved for track or large events in Monte Hale arena. “They’re working on those right now with some new motors, so they don’t have to pull them out by hand,” said current athletic director Chris Massaro. Work is also under way to replace existing rails with modern ADA-approved railings, which should be in place by Dec. 28. The current bleacher repair cost of $248,000, which will be paid for locally out of the university’s Murphy Center Repair and Replacement Fund. There is a capital maintenance request for re-roofing Murphy Center for July 2013, at a cost of $2.72 million. Other proposed 2014 renovations include $1.62 million in state capital maintenance funding for HVAC renovations and $3.65 million for restroom renovations, lighting improvements and acoustical renovations and ceiling grid replacement required as a result of the HVAC renovations. The cost of even replicating what was built in 1972 would be cost-prohibitive today, according to Patti Miller, assistant vice president for campus planning. The total current seating capacity of 11,750 for the arena seems adequate for today, even though two commencements are required at the end of spring and fall semesters to accommodate family and friends. World Outreach Church also uses the arena for two large Easter services. Earle said Murphy Center gave him a great recruiting tool like no other when it opened. “It’s still a great facility and well-maintained,” he said. Bill Smotherman, now age 75 and retired, was hired as facilities manager for MTSU in August 1972 and got to see the last few months before Murphy Center was completed. He said the building has seen great use as the host site for the TSSAA’s state high school basketball tournaments each March. “I still say it’s one of the most functional buildings on campus for the diversity of activities that take place there,” Pigg said. Many want to see Murphy Center to be used for many more years and can’t imagine the university without it. Massaro said the facility is still functional for Blue Raider sports. He said even with the planned change to Conference USA by July 1, 2014, he said MTSU teams will be able to compete. “This building is very special to me,” added Davis. “When you stay at a place for 11 years and you come every day to work in here, it’s special to you. In a 2011 interview with The DNJ, Massaro said long-range plans would see the construction of an indoor track facility around an indoor football practice facility on campus. That would allow the indoor track facility on Murphy Center’s upper level to be cleared, along with some of the wooden bleachers, to build some suites on the track level. After MTSU announced plans to join Conference USA, Massaro said those plans may be revisited. “We are going to have to have people look at it. We have had some discussions of hiring some experts to evaluate that and determine whether club-level seating would work or suites. “We’ll have some serious dialogue on what our capacity needs to be to accommodate all our events – basketball and convocations and graduations,” he said. “Well, we will have to re-sand the floor to put a different logo down when we join. But I think the Murphy Center is one of those things that, regardless of conference affiliation, there are some needs there because it’s a 40-year-old building,” Massaro said. “But it’s not like the building isn’t functional or that it’s a negative. • Over the years, the roof has had a number of leaks, which have been repaired. The last re-roof was in 1995. • Original hardwood floor replaced (2003): $195,000. • The university installed photographic strobes at strategic locations when MTSU hosted the Sun Belt Basketball Championships in 2006. • Four LED video boards (added Sept. 2012): $198,000. • HVAC system in the main arena, arena restroom renovations and improved arena lighting (summer 2014): $5.27 million. This includes $1.62 million in state capital maintenance funding for HVAC renovations, $3.65 million of plant funds/ non-auxiliary for the restroom renovations, lighting improvements and acoustical renovations and ceiling grid replacement required as a result of the HVAC renovations. • Unless there are NCAA or Sun Belt Conference rule changes which necessitate an exception, the main floor is scheduled for refinish every two years. The floor was last sanded, repainted and resealed in summer 2012: $28,000. MURFREESBORO — Murphy Center has provided many memorable moments since opening its doors 40 years ago. The “King” Elvis Presley performed back-to-back nights in the 1970s, much to the delight of scarf-chasing female fans. At one time, Murphy Center was one of the most popular venues for hosting concerts. It has hosted hundreds of graduation ceremonies. When built, it was a state-of-the art facility, and has been more than just an athletic facility. But most of my memories have come via athletics. I can remember watching the great Hershel Walker run in a track meet at Murphy Center. Who can forget watching Magic Johnson and Michigan State in an NCAA regional that was hosted by MTSU at Murphy Center? Well, some of you probably don’t recall that one. MTSU women’s basketball has enjoyed many thrilling games produced by coaches Larry Joe Inman, Jim Davis, Lewis Bivens, Stephany Smith and current coach Rick Insell. I’ve got to admit, though, men’s basketball is what I recall most. Former MTSU basketball coach Jimmy Earle gave Blue Raider fans their first Ohio Valley Conference title back in 1975.
Who can forget those great games against Austin Peay, which featured New York playground legend Fly Williams? Earle retired after the 1979 season and was succeeded by Stan Simpson, who led the Blue Raiders to the OVC tournament title in 1982 and an eventual stunning upset over Kentucky in the NCAA tournament in Nashville. Earlier that year, MTSU lost a true friend when its longtime play-by-play announcer Monte Hale Sr. lost a long and courageous battle to cancer. He was so revered by the university that the players wore black patches on their uniforms when MTSU pulled off the incredible upset of Kentucky. Bruce Stewart eventually took over for Simpson and enjoyed an incredible seven-year run with the Blue Raiders. Times have been tough since MTSU went to the NCAA tournament last in 1989, but a good NIT run last season by coach Kermit Davis’ squad, coupled with a fast start this year, has the excitement back at Murphy Center. The greatest Murphy Center moment of all time? It’s certainly debatable, but not from my standpoint. On Dec. 8, 1982 — almost a year after my father’s death — I enjoyed my biggest thrill ever at Murphy Center. On that evening, MTSU was playing Western Kentucky at home, and before the tipoff the playing floor was officially named the Monte Hale Arena. It was an awesome and proud moment, and it was accentuated by the fact his parents were in attendance. I’ve been fortunate to attend many events at Murphy Center. Three that come to mind the most are when my oldest daughter graduated there from high school and college, and the other being when my youngest daughter graduated from high school last year. And every time I walk into Murphy Center, I vividly remember the night when the playing facility was named the Monte Hale Arena. In addition to astounding sports moments, Murphy Center was also a popular venue for big-name artists for decades, such as Elvis Presley, The Judds, Garth Brooks, U2, Diana Ross, Luther Vandross, Bob Hope, Lionel Richie, Tina Turner, Randy Travis and more. • MTSU Athletics Opening Night (12/11/72) – MTSU opens its new sports mecca against Vanderbilt, with the Commodores claiming a 69-57 win over a scrappy Blue Raider squad. • Thanks for the Memories (4/5/73) – In its inaugural year, Murphy Center hosts a show by legendary comic Bob Hope. • Timeout Jimmerson! (1/26/74) – Middle Tennessee trailed by ten with just over 1:00 to play in regulation. A furious Raider rally tied the game before MT defeated Austin Peay and Fly Williams in overtime, 90-87. This game is regarded as the greatest late-game comeback in Blue Raider history. • Elvis Presley (1974 & 1975) – The King of rock ‘n’ roll plays five shows over a two-year period to sell-out crowds. • Raiders Swat Fly, Govs (1/27/75) – In a game that featured Austin Peay standout Fly Williams, a fan in a giant Raid can and a packed house, The Blue Raiders started fast and never looked back in handing the Governors a 101-70 thrashing. The game featured a slam dunk by Blue Raider George Sorrell. What made that unique was the fact that it was during the era when dunking was not allowed by the NCAA. However, it proved to be the perfect exclamation point in the Blue Raider victory. • Impossible Dream Come True (3/1/75) – Middle Tennessee closed out the 1974-75 basketball season hosting Western Kentucky with the regular season crown on the line. The Blue Raiders won the game 89-86, and claimed their first-ever OVC regular season title. • Volunteer Jam II (9/12/75) – After originating the all-star jam in Nashville, the Charlie Daniels Band hosts the second Volunteer Jam at the Murphy Center. The eight-hour show became a staple for music lovers for years to come. • Last Chance Meet (1976) – Middle Tennessee originated the “Last Chance Meet” to give tracksters from around the country one last chance to make qualifying times or scores to make the NCAA Indoor Championships. The meet became one of the most popular and influential in the country. • Purple Aces Remembered (12/14/77) – Instead of the schedule game between Middle Tennessee and Evansville, Blue Raider fans gathered to mourn the loss of Purple Aces. The entire traveling party was killed in a plane crash the day before while taking off from Evansville on their way to Murfreesboro. It is regarded as one of the greatest tragedies in college basketball history. • NCAA Mideast Regional (1979) – This event put Murphy Center on a national stage ,hosting tourney qualifiers Michigan State, Tennessee, Notre Dame, Lamar and Eastern Kentucky. The Spartans and Magic Johnson began their run toward the national championship with two wins in Murfreesboro. • MT wins OVC Tourney Title (3/2/86) – Seeded fourth, Middle Tennessee marched through the 1986 OVC Tournament with a win over top-seed Tennessee Tech in the semi-finals and a championship win over Youngstown State in the finals. The Raiders got an opportunity for the win when the Penguins called a fateful extra timeout in the final seconds of the game. • Kenny & Dolly (11/01/86) – Superstar Kenny Rogers performed several times at the Murphy Center, but none of the shows generated the buzz that his “Islands in the Stream” show with Dolly Parton did. Rogers had another solo performance and one show with country diva Dottie West. • NIT win over Vols (3/18/88) – In a much-anticipated matchup, Middle Tennessee hosts Tennessee in the first round of the National Invitation Tournament. The Blue Raiders led most of the way and claimed the win, 85-80. Chris Rainey led five Blue Raiders in double figures with 20 points. • Dogs feel the Bite (3/22/88) – Riding high from the Tennessee win, the Blue Raiders were awarded a second home game against Georgia. Tyrus Baynham scored 24 points to lead the Raiders to their second win over an SEC squad in less than a week, 69-59. • Back to the USSR (12/1/1988) – Bruce Stewart’s Blue Raiders were the only college team in the country to defeat the vaunted gold-winning Soviet National Team in exhibition play at Murphy Center, 101-95 (OT). • The Judds Farewell Concert (12/4/91) – Wynonna and Naomi Judd threw a farewell party for themselves and a national pay-per-view audience. It was to be their final concert together. Since then, they have performed limited engagements together while Wynonna continues her music career as a solo artist. • Women of Country (10/6/92) – A “made-for-television” concert featuring the top female talent in the country music industry was hosted at Murphy Center and broadcast nationwide on the CBS television network. Some of the artists in the show included Kathy Mattea, Pam Tillis and Mary Chapin Carpenter. • TSSAA Championships – By January 1993, 90 girls and 69 boys state basketball champions had been crowned on the Murphy Center floor since the championships came to Murfreesboro. The boys tournament left for seven years before returning. • Garth Brooks (3/2-3/5/94) – Four straight sellouts at Murphy Center combined with one other Brooks concert made this superstar the ticket-sales leader for entertainment acts at Murphy Center. The 1994 concerts sold over 48,000 tickets in less than two hours. • Raiders sink Vandy (2/1/95) – Middle Tennessee and Vanderbilt hooked up for an extremely entertaining game at Murphy Center. After the Commodores hit a three-point basket to force overtime, the Blue Raiders prevailed over the local rival, 93-90. • MT hosts Tar Heels (11/30/98) – The highest-rated team to visit Middle Tennessee, the fourth-ranked North Carolina Tar Heels defeat the Blue Raiders in front of over 10,000 fans. • Raiders host Jayhawks (12/5/99) – For the second straight season, MT hosts one of the top college basketball programs in the country in Kansas. The Jayhawks claimed a 97-77 win. • Four OTs vs. Tech (2/12/2000) – The Blue Raiders and longtime rival Tennessee TEch match up in the longest game in Murphy Center history. The Blue Raiders outlasted the Golden Eagles, 108-104. • Operation Full House (2004) – Murphy Center sets a new attendance record against Western Kentucky, which the Blue Raiders won 73-59. Aaron Todd, a chemistry and and physics professor, wanted to see one more game with Murphy Center filled and 11,807 fans attended. • Tournament Runs (2012) – Last season, Middle Tennessee fans witnessed history as the women’s basketball squad finished the year 26-7 (16-0) in the Sun Belt Conference after falling in the first round of the NCAA tournament. The men finished 27-7 (14-2) in the SBC, including wins over UCLA and Tennessee and Tennessee before losing to Minnesota in the third round of the National Invitation Tournament. • Murphy Magic – Murphy Center has seen over 55,000 alums walk across the stage at graduation, three MTSU presidents inaugurated (Dr. Sam Ingram, Dr. James Walker, and Dr. Sidney McPhee), 89 track and field All-Americans, 27 indoor track and field conference championships, seven men’s basketball regular season and five tournament conference championships and 28 women’s basketball conference championships (16 regular season and 12 tournaments). The first graduation at Murphy Center happened on Dec. 22, 1972. While Murphy Center has seen many great MTSU track stars gain national and international fame, it’s also seen a number of legends from opposing teams as well, including Georgia tailback Herschel Walker, Auburn running back Bo Jackson and Auburn world-class sprinter Harvey Glance.